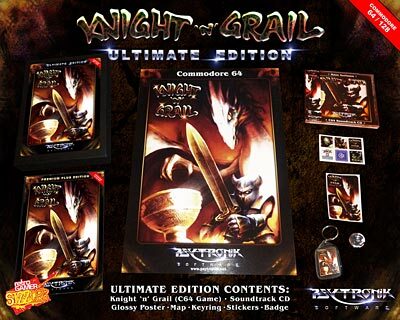 At long last the incredible C64 game Knight 'n' Grail is available in a stunning LIMITED EDITION COLLECTOR'S BOX SET! The game has been completely re-packaged and this special box set contains an array of exciting Knight 'n' Grail bonus extras. 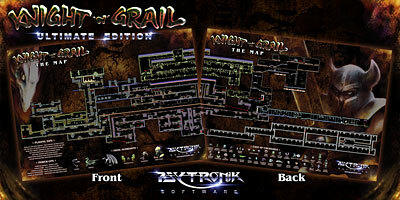 The ULTIMATE EDITION of Knight 'n' Grail is presented in a deluxe A5 box with glossy front and rear artwork. PLEASE NOTE: Only 100 x Knight 'n' Grail Ultimate Edition box sets have been produced in total so please register your order quickly in order to avoid missing out! Already own the game and don't want to buy it again? Don't worry, an ULTIMATE UPGRADE is available that features everything in the box set apart from the actual game itself! CLICK HERE FOR DETAILS! • Deluxe A5 individually numbered box featuring full colour front + rear artwork. • Knight 'n' Grail C64 disk presented in new full colour PREMIUM+ packaging. 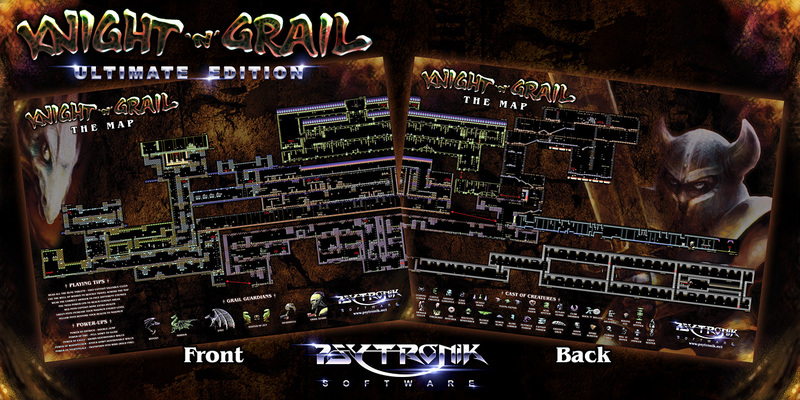 • Stunning double-sided A3 map showing every single screen / secret / object / enemy along with hints & tips + cast of creatures! • 40 track music CD featuring the complete KnG C64 soundtrack, KnG musical sketches + remixes, the Fairy Well C64 soundtrack + bonus C64 tunes by Hans Axelsson! • Super-glossy A3 artwork poster! (Note: This will be packaged ROLLED to avoid creasing rather than folded). • KnG Keyring (featuring different front + back designs)! • Set of 6 KnG mini-stickers! • Bonus C64 game 'Fairy Well' from KnG author Mikael Tillander!